Adviana watches 3 CdA spinners spin. Her mother and grandmother participated. Four of the 7 Club de Artesanas (CdA) members participated in Spinzilla, so they spun and chatted on Tuesday and Thursday. 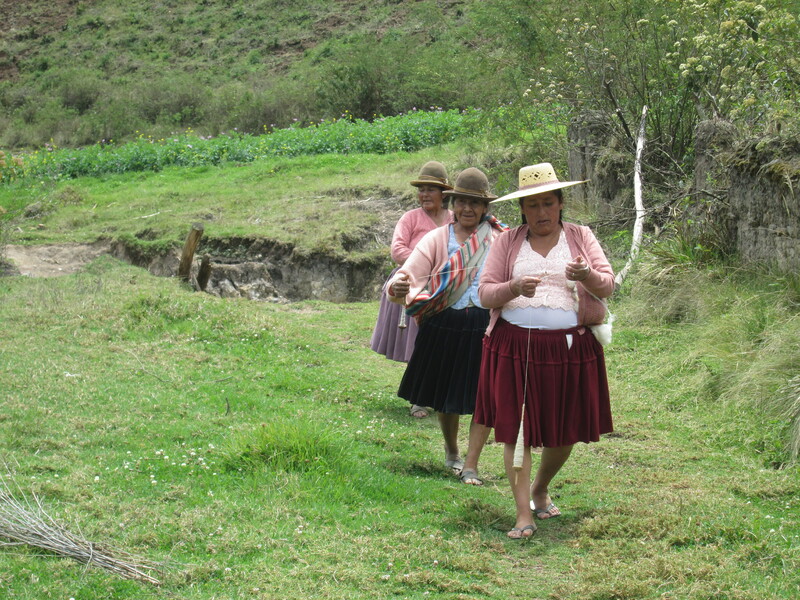 On Wednesday we contracted a vehicle to take Doñas Máxima and Antonia, Jonathan McCarthy, and me to the señoras home community of Huancarani to see how some the participants there were faring. After a week of rain the sun smiled on us and quickly turned the slippery muddy morass of a route into a useable road. 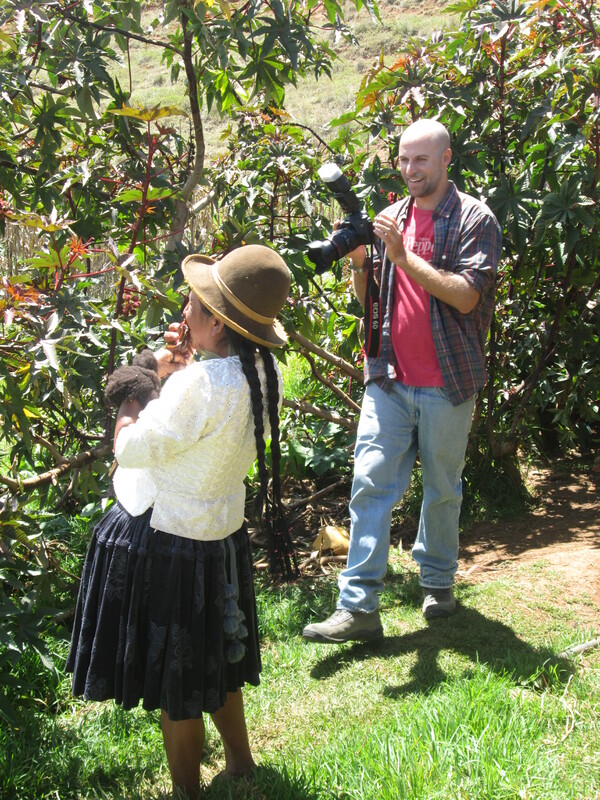 Jonathan McCarthy is a friend from Cochabamba and kindly volunteered to spend part of the week photographing and filming the women spinning. 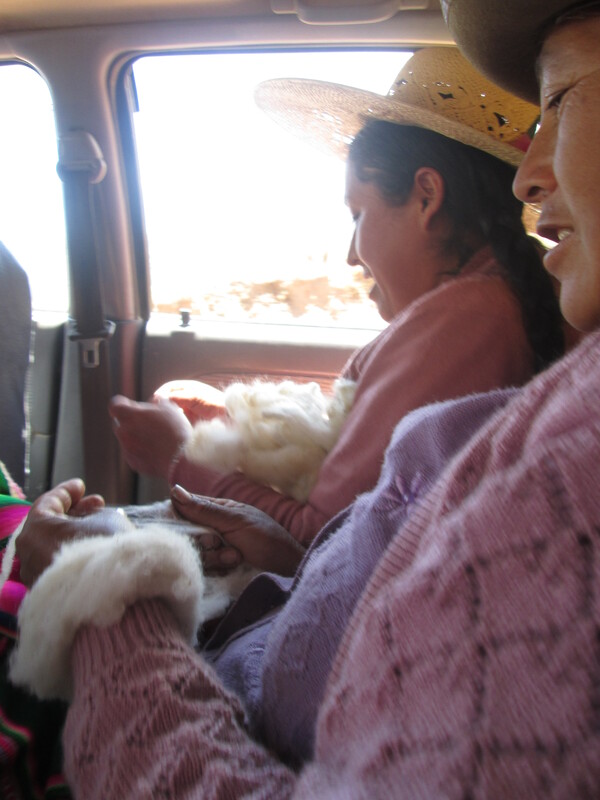 Doña Máxima and Doña Antonia were first sighted as they walked from their homes, their drop spindles whirling; they continued to try to spin after we three women piled into the backseat of the SUV. The ride was an hour up, across, and down the mountains to where the Huancarani farmsteads are spread out at about 9,000´. For our first stop we followed a newly bulldozed “road” that had been an old well-trod trail to the west side of Huancarani. 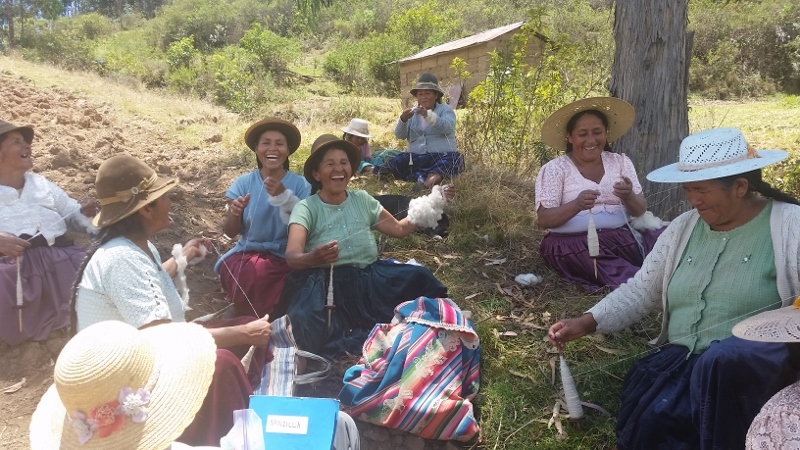 Doña Narciza was waiting for us with a huge smile, and continued to laugh and smile throughout our visit. Visitors were a novelty for her. 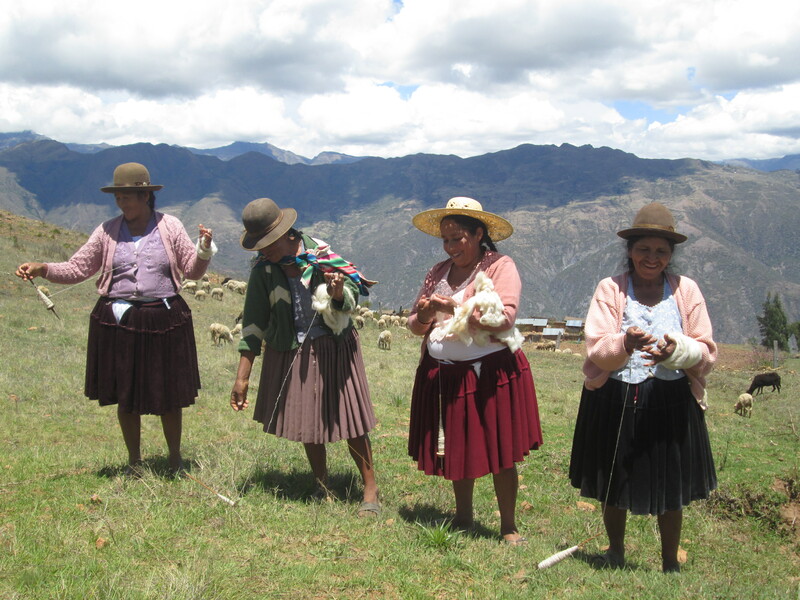 She usually arrives late to our workshops which are held in the community center (school, soccer field, church, and occasionally staffed health post), but almost always arrives, sometimes herding her goats – long walk. 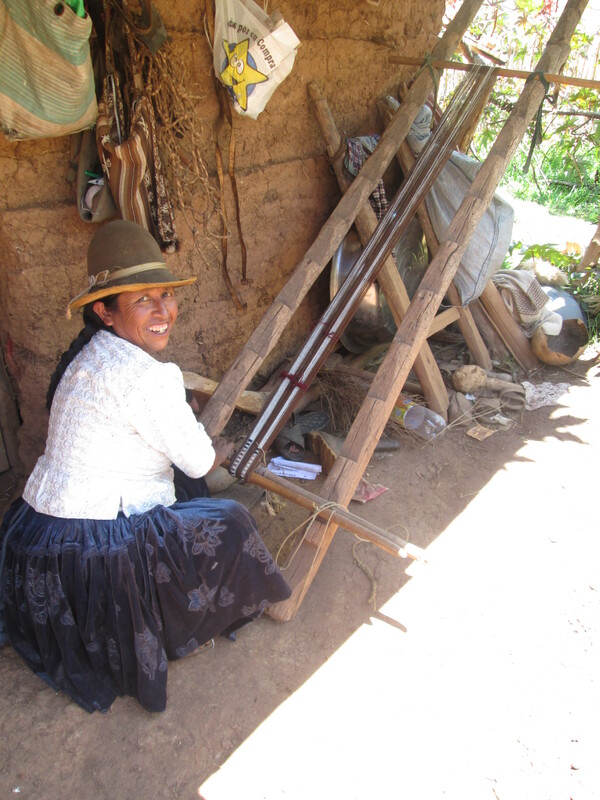 She is the top producing and finest weaver in the area, and I´d always wanted to see her at her loom. The sales of her weavings provide her with the means to support her 2 youngest of 5 daughters who study in the city and a granddaughter she is raising. 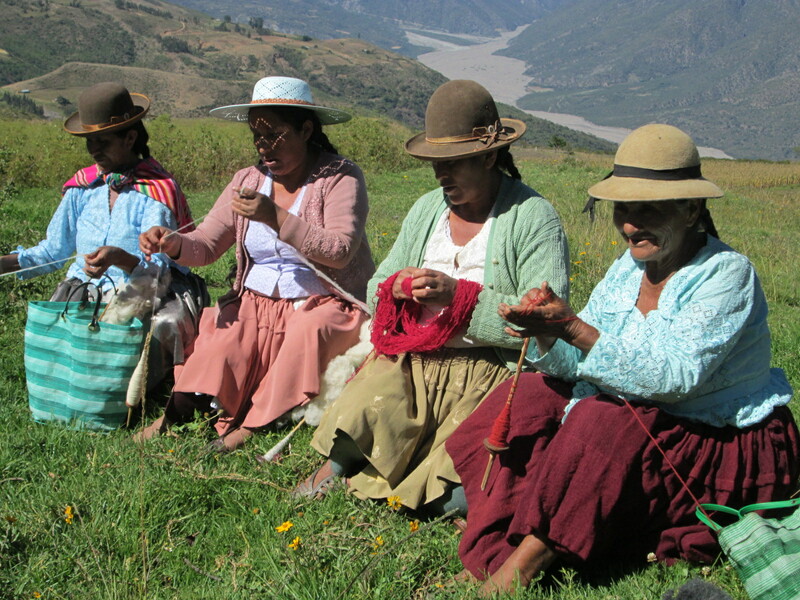 She was weaving 2 straps out of llama fiber and will assemble them with a rolled border to the figured cloth she has woven from llama fiber to make ch’upsas (shoulder bags). Nothing could be done until we plopped down to share the bowl of boiled potato, noodles, chili pepper, and fried egg she´d prepared for us. The mountain vista was spectacular. Her husband had taken off with the goat herd, she would follow later with her 2 sheep and the baby goats who were munching away on dried stalks in last year´s corn field. 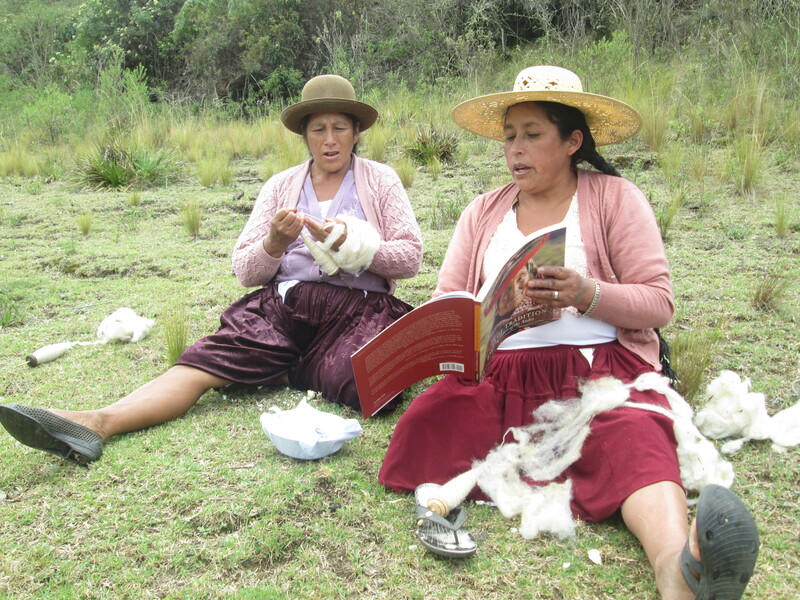 It´s curious that as the top producing weaver that she raises goats and buys fleece for her weavings from others. She was loathe for us to leave but needed to head out with their cattle, her 2 pet sheep, and the kids to allow them to graze. There were 2 other homes in the area, and the next stop was to visit Doña Alicia, who had kept her flock of sheep by the house so we could take photos. She was spinning away in the middle of them as we drove up. Doña Justina was visiting her sister next door so she walked over to us spinning away. The women enjoyed a visit while Jonathan and I clicked away with our cameras. We were running late as usual, but couldn´t move on until we stopped by Doña Julia´s house to partake in a bowl of rice, potato, fried egg, and salad of lettuce and tomato. She showed us the ½ a blanket woven in bold stripes of color that she had just taken off her loom. We ate quickly because she needed to be on her way to fields afar with her flock. Doñas Justina, Máxima, and Antonia crowded into the backseat of the SUV spinning and laughing as we bounced along the way we´d come to return to the main road to the center of the community. Doña Casimira was spinning and waiting for us along the side of the road because she doesn´t have a flock. She pointed off in the direction Doña Toribia had headed, and we could make out the white dots of Doña Toribia´s sheep on the hillside. We headed off on foot, on a very Middle Earth Shire-like trail, the 4 women spinning away. Upon meeting up, Doña Toribia provided us with a bowl boiled potatoes, noodles, and fried eggs to share. 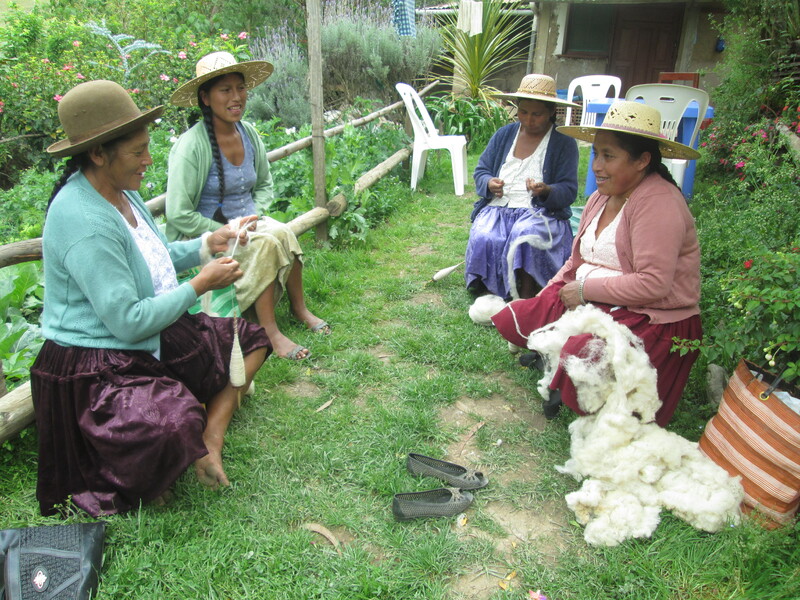 There was a lot of laughter as the women chatted and spun whiling away the afternoon enjoying each other´s company. I´d packed along a copy of Nilda Callañaupa´s book, “Faces of Tradition, Weaving Elders”, thinking it appropriate to get some photos because it was published by the Spinzilla Team Warmis Phuskadoras sponsor, Thrums, LCC. A couple had looked through the book on other occasions, but all enjoyed looking at the pictures again.